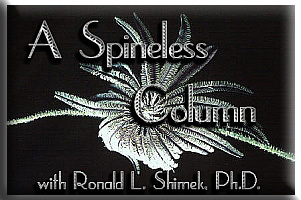 Of the common reef aquarium animals, only the polychaete annelids, or so-called bristle worms, are more misunderstood and badly treated than the common snails that many aquarists put into their systems to graze on or remove algae. Relatively little thought generally goes into the choice of these animals and, judging from the questions asked in my online forum, even less thought goes into their care. This maltreatment often results in significant mortality. But who cares, they're only snails, right? The moral and ethical issues of treating living organisms as "disposable" aside, I care. Snails are fascinating, complex, and often beautiful animals. The evolutionary radiation of body form in animals that can be called "snail" is one of the life's most successful stories. Depending on which way the taxonomic estimate is made, there are an estimated 35,000 to 150,000 living species of snails. This makes the "lowly" snails the largest animal group other than insects. Reflecting this amazing diversity, they have occupied every terrestrial and aquatic habitat on Earth. I will devote this and my next two columns to briefly discussing some of the major groups of the common grazing snails that are kept in aquaria to assist in the control of algae. In this initial column, I will cover a rather large assemblage of similar-looking snails commonly sold in the aquarium hobby. Their similarity of shell shape and internal structures is an indication that they are closely related and that they share many attributes in common. Their structural similarities allow an author to cover a lot of ground by generalizing and focusing on like attributes. However, in such situations, it is always worth the reader's time to remember that no two species have the same requirements. Each species is special and unique in its own attributes, and discussions of generalities can go only so far. So, read what I have to say with a critical eye. I will also cover several of these animals more specifically. This first major group contains those animals, often referred to by aquarists as Turbo, Trochus and Astraea grazers, is called by the scientists who study these animals, the "Superfamily Trochoidea." A superfamily is a large, inclusive, group containing many smaller groupings of superficially similar animals differing in characteristics, at the family level, that are generally considered to be relatively minor. Within the snails, such minor characters are often manifested in small differences in shell shape, operculum, and shell ornamentation. The evolutionary interrelationships within mollusks have been the subject of much research within the last twenty or so years, and as a result the taxonomy of the whole phylum has been undergoing a set of major changes. Presently, these animals are taxonomically classified as being in species that taxonomists have placed in the Families Trochidae and Turbinidae of the Superfamily Trochoidea. That Superfamily is, in turn, placed in a larger group called an Order. The Ordinal name is uncertain at the present time as it is undergoing revision, but it is one of several orders within the Superorder Vetigastropoda of the Subclass Orthogastropoda. All of these, of course, are within the Class Gastropoda, which contains all the snails. One can refer to all of the grazers I will discuss in this column as Trochoidean snails. Trochoidean gastropods include all the Turbo, Astraea, Trochus and related animals such as Margarites, Stomatella, Norrisia, and Tegula. 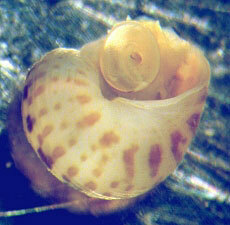 There are many other snails that eat algae in aquaria, consequently the Trochoidea is not all-inclusive of grazers. It does not include the nerites, abalone, limpets, the ceriths, conchs, and some cowries. These latter animals are perfectly good algae-eating animals, but they are only very distantly related to the trochoidean grazers, and I will cover them in future columns. Most, but not all, of the Trochoideans have shells that look rather similar; as they should if they are all closely related. It is, in a sense, this similarity that prompted this column, as these animals are often difficult for hobbyists to tell apart. Their similar shell shapes may sometimes be deceiving, though. Stomatella varia has a small, flattened, cap-shaped shell and tends to look like a slug. It is, however, a good Trochoidean snail. Nevertheless, the shell is decidedly an odd one for the group. Malacology, or the scientific study of mollusks, began in the sixteenth century among the shell collections or "conchological cabinets" of the "gentlemen naturalists" of that period. These were individuals who had the considerable wealth necessary to indulge their whims by collecting sea shells and other marine oddities to include in their displays, which were often kept in large mansions. Incidentally, the study of corals started at the same time, as coral skeletons were among the items included in these collections. In time, these collections became the basis for many modern museum collections. At the time of the collection, however, the collectors had no consistent way to describe the shells that made up their collections, and over the course of about a century, malacology arose primarily as a way of identifying these shells. In the process, a rather complex and descriptive terminology developed, which allowed the discussion of the various aspects of snail shell shape. I will try to ignore most of this terminology, but some of it is inescapable in a discussion of closely-related snails, because in general, the most visible differences between species are related to differences in shell features. I think it is useful to start a discussion of a snail shell by considering the basic animal to be a slug, without a shell. Such an animal is essentially a mound of flesh that creeps along on a broad, flat foot. Now, consider that slug with a shell over the top. The shell would likely be rather shield- or cap-shaped, probably something like that found on a limpet. One of the characteristics of snails is that they grow primarily in a top-to-bottom, rather than a front-to-back or side-to-side, direction. In other words, as they add mass to their body, they get thicker, not longer or wider. This means they become taller, and higher off the substrate. Given such growth, the flat cap shell would change to look something like the shape seen in a flat, broad, ice-cream cone. Further growth would tend to make the shell have a truly conical shape, much like an ice-cream cone. If one pictures a small slug carrying a sharply pointed ice-cream cone shaped shell oriented vertically on its back, it is probably obvious that such a shell would be unstable. The way in which this instability was solved appears to have been by coiling the shell. 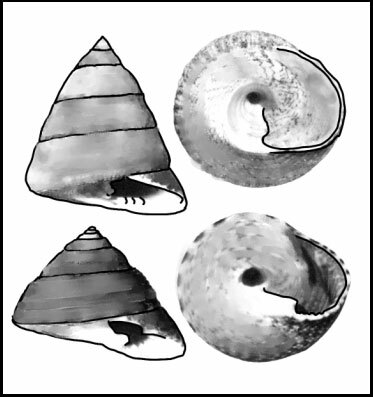 Coiling makes many snail shells doubly conical. They are cones coiled in a conical manner. This coiling pattern creates a shell that is helically coiled; in other words, it's basically spiral in shape, but occupies three dimensions. Each complete 360° "lap" of the coil is called a whorl. The largest and last whorl contains the aperture into which the animal can withdraw, and is called the body whorl. The relative shape of the animal depends on three main factors: the shape of the aperture (which defines the shape of the whorl itself), the rate at which the whorl gets bigger, and the rate at which the aperture moves away from the coil's center. Varying those three factors together can produce all possible snail shell shapes. Fortunately, in the Trochoidean snails, there is not a lot of diversity in shell shape (Figure 1). In some respects, this is a problem, as they all tend to look a lot alike. On the other hand, it makes recognition of the basic Trochoidean pretty simple. Figure 1. 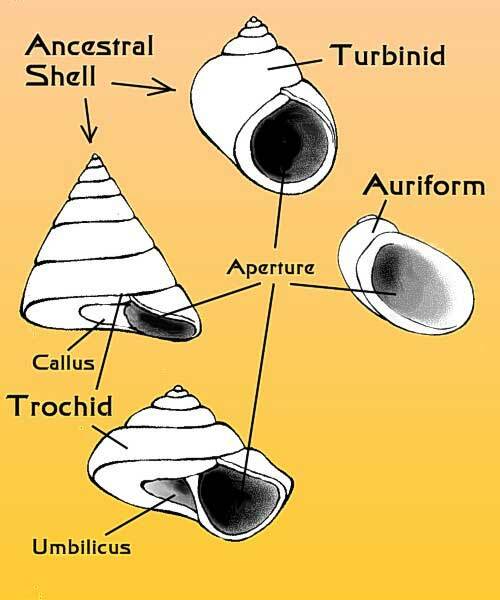 The basic shell forms found in trochoidean snails. 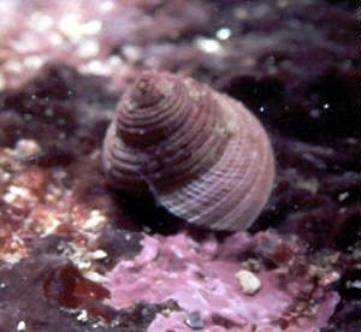 Turban snails tend to have rounded whorls, while trochids tend to have smooth-sided shells. Although I have illustrated them using only the trochid shells, either shell type may have an umbilicus, a "belly button" or a pit on the underside of the shell caused by the coiling, or a callus, a calcareous plug filling the hole. The auriform shell is formed when the whorl enlarges very rapidly relative to the coiling rate and is found in animals such as Stomatella. It is not for the shells, however, that we aquarists put these animals into our tank. To be succinct, we buy these snails for their grazing ability and dietary preferences. Snails, in general, and Trochoideans, in particular, are called "microphagous" feeders. This means they feed on small particulate materials. They get such materials by sweeping or rasping them off the substrate. This rasping ability is related to, and determined by, a structure found only in mollusks called the "radula." The radula (plural = radulae or radulas) is a projection arising from a pit in the bottom of the front part of the digestive tract, just inside the mouth. One side of the radula is covered with spiny projections. In their simplest forms, these spines are made of cuticular material, basically protein and chitin. Vertebrate teeth are also basically cuticular and are found in the mouth and, because of these similarities, the spines on a mollusk's "tongue" are called "radular teeth." 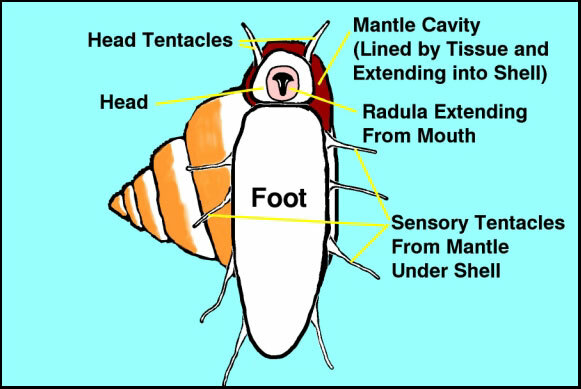 I have drawn a simplified diagram of the structures inside the front part of a snail's head, as if it were cut down the middle and viewed from the side (Figure 2). Figure 2. Diagram of the radula of a common snail shown in longitudinal section. 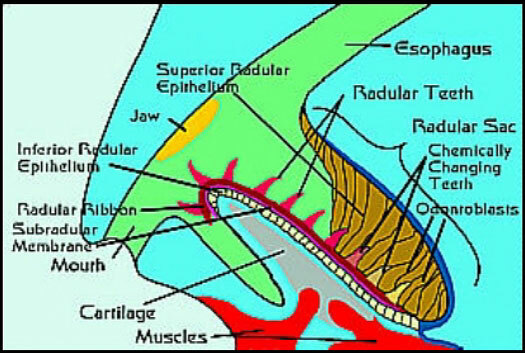 The radular teeth (red) sit on a radular ribbon (pink) and both are formed in the inside of a radular sac that projects from the bottom of a cavity just behind the mouth. The teeth and ribbon are secreted in the bottom of the radular sac and used teeth are sloughed off into the mouth. The teeth and ribbon sit on cartilage, and the cartilage may be pushed out and pulled in through the mouth by the action of muscles. The radular teeth are relatively complex structures (Figure 3) and there may be several hundred rows. The snails' rasping may wear out several dozen rows of teeth per day. Figure 3. Scanning electron micrographs of the working surfaces of the radulae from three different Trochoidean snails. These are the rasping surfaces of the snail's radula. Each photograph is from an individual of a species in the genus indicated, and each shows a view about 1-2 mm (0.04 inch) wide. 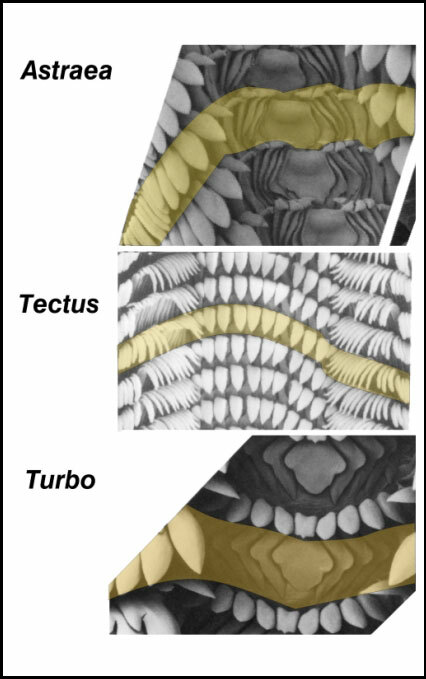 Tectus has a radula similar to Trochus and is included here to show the general type of radula found in that genus. Each yellow band highlights a single row of teeth. Note the wide diversity of tooth shapes. Photos are modified from Hickman and McLean, 1990. All of these snails feed by moving along the substrate (Figure 4) and periodically "licking" the surface with their radula. In Figure 3, you can clearly see that the design and number of radular teeth is different in each genus or group of species. This difference in the teeth HAS to be reflected in feeding differences - different species will feed on either different algae or different types of substrate (discussed below). The teeth are probably optimized for some algal types, but the feeding behavior and natural history of the Trochoideans is poorly known. It is presumed that most are herbivores, but evidence suggests that a significant number are at least partially carnivorous. Figure 4. Diagram of a typical Trochoidean grazing snail in a common feeding posture on aquarium glass. Acclimation Problems, Or Why Do They Die? The complexity of internal anatomy in snails is one major reason why some of the Trochoideans seem to die easily, or otherwise not live through their full life spans in our tanks. Although most folks probably never give it a second thought, snails have a complex internal morphology. In many ways, the internal structures that the snails possess have allowed them to be very successful. It is not, however, a particularly "rugged" morphology when subjected to some specific stresses. Snail tissues often seem to be composed of thin layers of tissue that are very filmy and diaphanous. Consequently, they often suffer significant damage during water changes or during transport from a dealer's to an aquarist's tank. The circulatory system of snails may be very complex (Figure 5), and many of its vessels and channels can rupture under stresses caused by changes in salinity. The vessels in the kidney are numerous and delicate, and may rupture if the animal is not slowly acclimated when being moved from one set of water conditions to another. If the acclimation is too fast, the animal will die in a few minutes to a few weeks. If the snails are drip acclimated, the acclimation time may need to be on the order of five to ten hours for maximal survival. Figure 5. 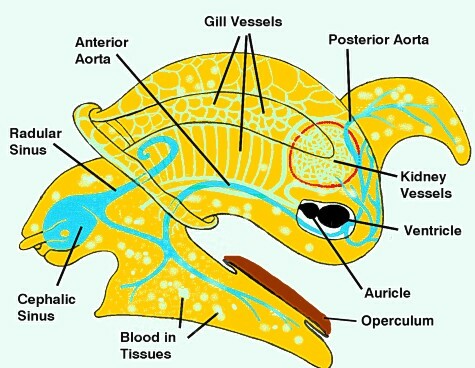 This diagram shows the circulatory system of one type of snail, showing the major blood vessels. The shell has not been drawn (Modified from Fretter and Graham, 1994). Arteries are shown in blue (Unlike the red blood of vertebrates, snail blood has hemocyanin as the respiratory pigment and oxygenated blood is blue; deoxygenated blood is colorless); veins are shown in green. Snails don't have capillaries connecting the articles and veins, instead blood flows directly through the tissues between the end of the artery and the beginning of a vein. Another factor in their long-term survival, of course, is the appropriate food. The diversity of radular structures that I illustrated above ought to convince most folks that these animals are not created equal with regard to their diets. Or to put it another way, they eat different things... This is a real problem for aquarists, who often perceive the various grazing snails as "interchangeable," when in fact they may require decidedly different conditions or foods for good health. Unfortunately, the real problem with most of the various grazers is that we haven't a clue what their requirements really are. There have been precious few studies in the natural world of the reefs that assess the determining factors of their existence, and consequently we are stuck with a "trial-and-error" response. This is further complicated by the fact that as hobbyists we really don't know, in most cases, where the animals originate, what microhabitat they inhabit, or even what species they are. It is relatively easy to distinguish between some of these grazers and I have cobbled together some illustrations to help identify them to genus. I have included some illustrations or links to those snails commonly offered for sale to hobbyists. Some of them are decidedly inappropriate for reef aquaria, and I have indicated those specifically. Although determining the genus is not terribly difficult, identification to species will take some expert consultation, as there are often several dozen to several hundred species in each of these genera. In all cases, however, there are several characters critical to identification. First, note the shape and composition of the operculum, or trapdoor, which plugs the animal's hole when it retracts (and with the exception of Stomatella and its near relatives, they all have one). When viewed from the side, are the edges of each whorl smoothly rounded, or more angular? Third, does the animal have any sculpture or ornament on it, such as ridges or lines? 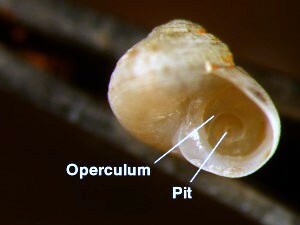 Fourth, does the animal have an open "umbilicus" (a pit in the bottom of the shell), or is that pit partially or completely filled by a calcareous "callus?" All of the above characters are used in assigning the animal to some of the various genera below. Be forewarned, most dealer identifications are wrong. These are animals with either a tall or squat shape. The aperture to the shell has an angulate, wavy or toothed appearance due to folds in the shell at the margin near the center of the shell. If the shell is looked at from the bottom, there is a hole in the center. The operculum is typically protein or horn-like material and is generally amber or brown. These are typically good grazers for reef aquaria. They are sold under several names by various dealers. Surprisingly, on some occasions they actually get named correctly, for Trochus, anyway. These genera are closely related and differ mostly by soft part anatomical and radular differences, and so the average hobbyist, and particularly the dealer, may be unable to distinguish them. Trochus or Tectus species seldom have any pronounced bumps, warts, or ridges on the shell surface. curves of shell material near the center of the shell, and the umbilicus at the bottom center of the shells. Turban shells, as their name implies, have a more rounded shape, like that of a turban. They have a large and prominent calcareous operculum. They may or may not have sculpturing. Turban shells may have a small umbilicus in the bottom center of the shell, but in most cases the hole is filled with a calcareous callus. rounded shape of the whorls and the large, white, calcareous operculum. Astraea (and yes, the spelling includes the second "a") may be thought of as "angular Turbo." The outer edges of the coiled whorls are not rounded or inflated as in Turbo, but are often straight or flattened. 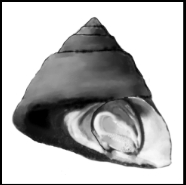 When viewed from the aperture side of the shell, Astraea tend to present the appearance of a smooth conical shell without the rounded edges visible in Turbo. Many Astraea have very prominent axial sculpture, so that when the animal is observed from above it appears star-shaped. That shape, in fact, gives the genus its name; "Astraea" means star, and they are commonly called "star shells." However, the Astraea species offered for sale in the aquarium hobby are generally not heavily sculpted, although various species may have small bumps or ridges. 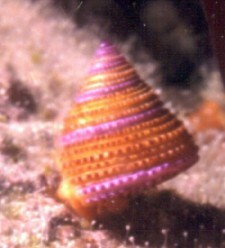 Most snails sold as Astraea in the marine reef hobby are trochid snails, although they are seldom from the genus Trochus. Many of the actual individuals of Astraea offered for sale in the reef aquarium hobby come from the cooler waters of Baja California. These animals are not from areas that have sand substrates or, really, much of anything else in the way of flat surfaces. If they get dislodged from rocks, they tend to fall into crevices or crannies where they can reach a rock with their foot and attach to it. Consequently, they have never developed a "righting response." This means that if they fall from the aquarium walls onto the sand, they will not be able to turn over, and will die there unless somebody or something turns them over. Given that they also are not warm water animals, they tend to die young and leave a good-looking corpse in the aquarium. Purchase them if you wish. I would spend my money on tropical species, however. Figure 8. Astraea, like Turbo, have a calcareous operculum, and unlike trochids they seldom have an open hole in the bottom center of the shell. Figure 9. A small, 2 cm high, species of Astraea with prominent ridges. Collonista are "mini-Turbo snails." They are seldom purchased by hobbyists, but are relatively common in reef tanks anyway, because they appear to hitchhike in on live rock or in some live sand. When hobbyists first see them, they presume them to be "baby" grazers of some sort. Instead, they have some of these animals. They reach a maximum adult size of about 1/4th inch (6 mm) in height and diameter. They are often tan to white and have mottled brown color patterns on the shell. They can be distinguished from all other Trochoideans by their small size and the presence of a small pit or hole in the center of the calcareous operculum that plugs the aperture. They reproduce well in aquaria, and are quite good grazers. If present in large numbers, they may effectively replace all other grazers in our systems. by the small pit in the center of their operculum. Almost slug-like, but possessing an auriform, cap-like shell, individuals of Stomatella seem unlikely to be Trochoideans. However odd their appearance, their internal anatomy puts them squarely in this group. Stomatella individuals may reach lengths of about an inch and a quarter (3 cm), and as their specific name of "varia" implies, they may be almost any color, although gray, black, and mottled colors tend to predominate. They are quite good grazers, and also reproduce well in aquaria lacking hermit crabs and shrimp predators. Their shell shape precludes their retraction into the shell, but evolution has given them a rather neat way to escape many predators. The rear portion of their foot can break off, much like some lizards' tails, when they are threatened by a predator. The detached portion then writhes, and twists and otherwise distracts the predator while the snail, presumably, makes good its escape. Additionally, they also tend to be nocturnal and avoid a lot of visually-oriented predators in this way. part of the shell. The odd shell shape, for a Trochoidean, is evident. Caveat Emptor!! Let The Buyer Beware!! A large number of Trochoideans are sold to reef aquarists despite having little or no chance of long-term survival in a reef tank. Most of these are collected from the northern shores of Baja California. Although it's south of the United States, the marine environment of the northern part of this peninsula is anything but tropical. Its Pacific side is bathed in waters that are quite cool, and is the home of several Trochoideans that are collected for the reef aquarium hobby. These animals typically have a tolerance for warm conditions, and they are often intertidal animals and can withstand quite hot water - for a while. Prolonged exposure to warm conditions, however, kills them. Among their many interesting attributes, many marine snails have impressively long life spans. I have counted over 120 annual growth rings on some specimens of Tegula funebralis, a temperate water species. This species is one of the three or four species of Trochoideans collected from cool water areas of Baja California and unethically sold to gullible, or informed, aquarists as a reef aquarium animal under the delightfully ambiguous name of "margarite or margarita snail. 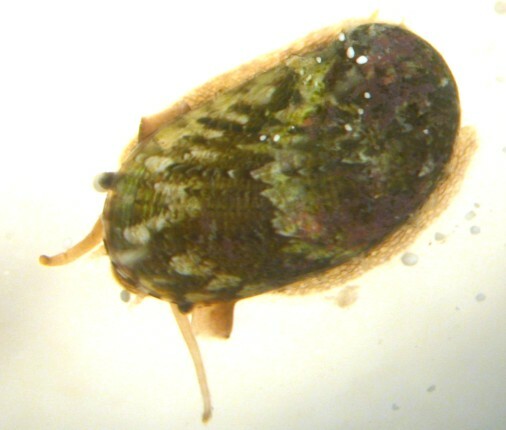 Tegula funebralis has a high thermal tolerance for an animal that lives in cold water areas (it ranges northward from Baja and is common in the British Columbian and Alaskan intertidal zones). They normally live a small fraction of one percent of their normal life span, or only a few months, in reef aquaria. Putting these animals in a reef aquarium is both unethical and immoral. Figure 12. Tegula, two species; Tegula funebralis, left, and Tegula brunnea, right. These cool water species of Tegula are harvested from the coast of either Baja California or California and sold under the name of "margarita" or "margarite" snails. Shells are about ¾ inch (2 cm) in diameter. Image modified from Hickman and McLean, 1990. Figure 13. Margarites pupillus, from Northern Puget Sound, photographed in water that was about 45°F. This species is a cool water animal and should not be purchased for a reef aquarium. The red turban or red-footed turban shell, Norrisia, is yet another cold water animal offered for sale to reef aquarists. As with individuals of the various Tegula and Margarites species, Norrisia individuals effectively get cooked slowly to death in reef aquaria. Norrisia individuals generally die faster than those of the various Tegula or Margarites species, however, because they not only get slowly poached, they also starve. This animal lives on the giant kelps off the central and southern California coasts, and grazes on the surface layers of the kelp. It really is not a diatom feeding animal so much as it is a feeder on kelp mucus and surface cells. Such food normally is lacking in reef aquaria, so while Norrisia looks nice in the aquarium, for a while at least, it has nothing to eat there. Figure 14. Norrisia norrisi, the Red-Footed Turban or the Red Turban Shell, found off the California coast, and sold to reef aquarists. Many of the various Trochoidean snails are effective grazers and thrive in coral reef aquaria. The key to finding the right species, however, is in finding species that are actually tropical, rather than temperate. Almost all the tropical species do well in reef tanks, while virtually none of the temperate forms persist. By and large, all of the species imported for the aquarium hobby feed primarily on diatoms, and their longevity in aquaria is directly dependant upon having sufficient food. Although one often sees advice to add "x number" of these snails per gallon, such advice generally results in the death of most or all of the snails, as they generally exhaust their food source and starve to death. It is better to add them to a tank a few at a time until there are sufficient grazers in the tank so that at the end of the day there is a barely visible film of diatoms on the rocks or aquarium walls. Such a film will be gone by the morning, and the snails will keep the diatoms in check henceforth. I will close with an image (Figure 15) of one cold-water Trochoidean thankfully never offered for sale to reef aquarists. The animal illustrated is Calliostoma annulatum, and I think it is one of the most beautiful snails. They reach about an inch and a half in diameter, and unlike their tropical cousins they are mostly, if not entirely carnivorous, eating hydroids and bryozoans. Figure 15. The ringed top shell, Calliostoma annulatum, found throughout the shallow-waters of the North Pacific. Fretter, V. and A. Graham. 1994. British Prosobranch Molluscs. Their functional anatomy and ecology. The Ray Society. London. Volume 161. 820 pp. Hickman, C. S. and J. H. McLean. 1990. 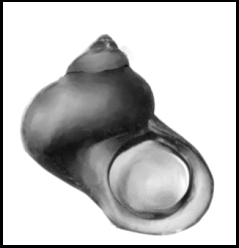 Systematic Revision and Suprageneric Classification of Trochacean Gastropods. Science Series of the Natural History Museum of Los Angeles County. 35:vi + 1-169pp. Abbott, D. P. and E. C. Haderlie. 1980. Prosobranchia: Marine snails. In: Morris, R. H., D. P. Abbott and E. C. Haderlie. Eds. Intertidal invertebrates of California. Stanford University Press. Stanford, California. pp. 231-307. Bell, L. J. 1992. Reproduction and larval development of the West Indian topshell, Cittarium pica (Trochidae), in the Bahamas. Bulletin of Marine Science. 51:250-266. Warén, A. 1990. Ontogenetic changes in the trochoidean (Archaeogastropoda) radula, with some phylogenetic interpretations. Zoologica Scripta. 19:179-187.